Brand Ambassador and Manager, Margie Murphy says, "I am very proud to be part of an amazing brand and serving my home town of Orange Park for the past 16 years. Our recent renovations and upgrades have made Grumpy's great again!" Grumpy's Restaurant opened its doors in 2002 and has been serving crowds of loyal locals since. Grumpy's serves a variety of made from scratch American Diner dishes and amazing breakfast and lunch specials each and every day. 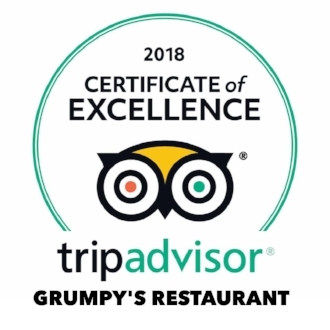 The Grumpy's Family cares about ensuring a satisfying dining experience for all and take exceptional pride in being locally owned, locally operated and locally managed. So at least a couple of days a month, I manage to eat something that looks like this. When Shawn introduced me to Grumpy’s I immediately knew that they would inspire a turly amazing breakfast. The synergy between food from scratch and recipes of everyday use that can be passed down from generation to generation is one of the things that inspires me most of this diner. 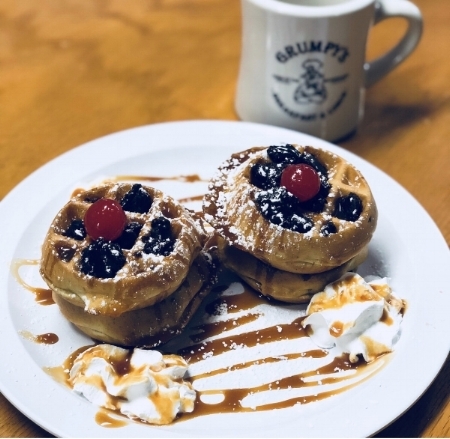 Home, food, family, and beauty around it all is the heart of the diner vibes at Grumpy’s Restaurant in Orange Park, Florida. And a nice home cooked breakfast serves as a gentle gateway into whatever else the day might hold, a buffer that begins the day with mindfulness and hopefully spills over into everything else. I can’t manage breakfast like this every day or even every weekend, but whether they come naturally to you or not, mornings like this are worth cultivating in the same way that it’s worth it to make things by hand and to support people who do. Add in the luxury of homemade waffles alongside the crispy bacon and even someone like me looks forward to this dish once or twice a month! We Are Pleased To Announce We Received The 2018 Trip Advisor Certificate of Excellence. We strive to give our customers the best experience possible, we love our locals! Grumpy's would like to introduce you to James, one of our beloved line cooks. James recently celebrated his 8 year anniversary with Grumpy’s Restaurant! James has 5 beautiful children and in his off time loves watching his favorite NBA team the San Antonio Spurs. The most enjoyable part about his job is speaking with guests at our counter who love what he creates. Thank you for all your hard work and dedication James! Sign up with your email address to receive promotions and updates for everything Grumpy!